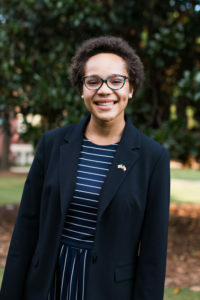 Alexandria Pinckney is a sophomore at the University of Georgia majoring in Political Science and minoring in Spanish. On campus, she is currently involved in the Spanish Immersion Program, the Thomas N. Lay Mentorship Program, and works as a tour guide at UGA’s Visitor’s Center. Alexandria was recently accepted into the Summer 2018 Honors in Washington program. She will move to Washington, DC in early June, where she will live and work for 9 weeks. Her assignment hasn’t been confirmed yet, but she is hoping to work with the Office of Civil Rights through the Department of Education.